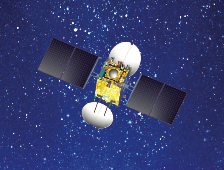 ANTRIX offers the highly reliable and versatile GSAT Communication Satellite Platform series, I1K Bus, I2K Bus, I3K Bus, I4K Bus and I6K Bus, with varying payload and power configurations. GSAT platforms have been utilised in various ISRO and customer satellite missions over the years. The GSAT platform with reliability accumulated over years of successful mission life is an ideal choice of customers for realisation of high quality, low cost and flexible satellites. The GSAT Communication Satellite platform series is complemented by India’s large integrated satellite manufacturing, assembly, integration and testing facilities in Bangalore, with a production capability of multiple satellites. ANTRIX offers end-to-end solution for your satellite program, from design, payload configuration, manufacturing, assembly, testing, launch services, LEOP support, In Orbit Testing, In Orbit Operations and Support, Orbital Relocation, establishment of Satellite Earth Stations, Gateway Stations and Mission Control Complex etc.